You can’t crack open a can of mystery without talk to the urban legend entitled, “The Killer in the Back Seat”. While legends can be told many different ways, with every way comes the identify bone chilling response to the story. This legend is one that audience are thrown off by but at the same time find themselves checking their backseats every time they get into a car. With Halloween quickly approaching spooky stories fill the air so it’s only appropriate to offer insight on one urban legend that grabs my attention. Better that it grabs my attention than my life from the back seat. According to many sources and from what I myself have been told the legends goes something like this. One night a woman hurried to her car after a night out with the girls. After making her way to her car she headed home by path of a deserted highway. It wasn’t long until she saw a pair of loan lights approaching her quickly. The car put n it turn signal with what seemed like intentions of passing her but then quickly changed its mind. After the car behind her began to distractingly taunt her with its blinkers and bright lights the women became frightened. With her exit insight she hoped she would soon lose the weird stranger, but he followed her through every turn. Before reaching her destination she had already analyzed her options and gathered that making a mad dash for the door was her best option. When she did so the stranger quickly followed with the same actions but also instantly yelled, “Lock your doors, call the police!” Come to find out the stranger following her was merely trying to save her life and was not near as scary as the killer whom had been camping out on her backseat. 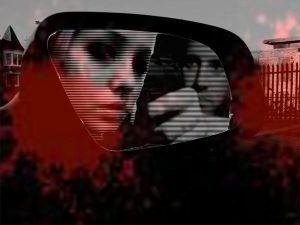 In a website created by David Emery readers are provided with an example (as told by Emily Dunbar) of the urban legend “the killer in the backseat”. The analysis of the article David Emery writes provides a summary that the moral to the story is to “always check the backseat”. The purpose of this website is to analyze the story and for the author to voice his opinion of what he learned from this urban legend. This source is unique because it tells the story of the common tale "The Killer in the Backseat." This website not only provides you with the story but it also gives you an analysis of another person’s perspective of the urban legend. The article and analysis on this web site is aimed at an audience that is interested in urban legends. As I said before this urban legend has been told many different way but its identifying features prove that the story did occur at one point in time. Whereas this story is meant as a thriller, it has many benefiting factors to its listeners. So I strongly urge you look into the stories heard throughout this time of year and grasp from it something other than its horror. "Don't Believe Everything You Read: 10 Driving Urban Legends." National Motorists Association. N.p., 2 Mar. 2010. Web. 13 Oct. 2012. Emery, David. "The Killer in the Backseat." About.com. N.p., 2012. Web. 11 Oct. 2012. "Killer in the Backseat:Urban Legend." Halloween Web. N.p., 2003. Web. 13 Oct. 2012. "Urban Legend Killer in the Backseat." ScaryForKids.com. N.p., 18 Dec. 2007. Web. 11 Oct. 2012. Zeller, Bob. "Urban Legends." Car And Driver. N.p., July 2004. Web. 13 Oct. 2012. Articles of different origins from which the urban legends “The Killer in the Backseat” was obtained. An Informational website that contains many different urban legends and different types of folklore. Additional Information of the origins of famous Urban Legends and American Folklore.